Physics 1 VCE Units 1 and 2 with eBookPLUS and studyON VCE Physics units 1 and 2 provides comprehensive coverage of the new VCE Study Design for 2016-2021. It includes Jacaranda’s unique exam preparation tool, studyON, which has been fully integrated with the text to maximise every student’s opportunity for exam success. 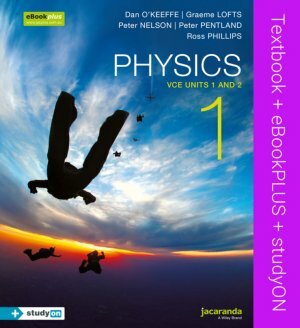 This resource is a hard-copy student text that includes the eBookPLUS and studyON VCE Physics Units 1 and 2. The Options chapters 14–25 can be found in your eBookPLUS. A copy of each chapter can be downloaded from the Resource panel. A sample of each chapter can be found in the print book following Chapter 13. Students will study only one Option chapter.